I have sneaked some computer time in to tell you that Stray Stitches is having a birthday giveaway Now back my break. Apparently Blogger is having some problems. I finally got back into my account, but discovered that several people have tried to comment on the last post and were unable to comment. Supposedly a fix is in the works. Since there is a holiday weekend coming up, and I have a little trip planned, I have decided to take several days off from my blog. I have to say that I have some amazing readers (friends) spread across the world. You make writing my blog a worthwhile endeavor. When I get back it may be a couple of days before I post. I just didn't want anyone to be worrying/wondering "what happened to Gene." Y'all have a great Memorial Day weekend. You have my permission to party! Why?, a photo by GeneBlack on Flickr. I can't get into blogger. ARRRRGH. WHY? I can get into other Google Services. This is making me crazy. First let me say, I hope the recipients aren't reading my blog. If they are it will lessen the surprise. I wanted to give them a little something that would serve as a reminder of our friendship. So I decided to make each of them a little zipper pouch. 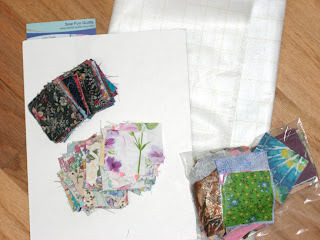 (A la Tonya at Tonya's Sewing Room go give Tonya some bloggy love.) These are made by fusing the lining to the outer fabric. I used WonderUnder this time, because I had it on hand. If you do any fusing at all you may have accidentally gotten some fusible on your iron. UGH! What a mess!!! Oh, you are wanting to see the pictures aren't you? Yes, these are friends I truly love - I put in zippers for them. Yes that does mean you! Have you ever used an embroidery machine redwork design on a finished quilt? I have read about using them to quilt with, but I want to hear from someone I "know" who has done it. I would also like to hear any tips or tricks you have for doing it. I would hate to wreck a quilt trying it. and Yes, I know I could do it with scrap batting and fabric, but well - If I don't hear from someone who has tried it, I suppose I will have to do that. I auditioned several fabrics for the binding to no avail. None of it was singing to me. Then I decided to look in my bin of fat quarters. There were two of the purple ones, just alike. I auditioned them and they sang a lovely song. Ahhhh, music to my eyes! After getting the convergence quilt layered over the weekend, (and yes, I did piece the back) I couldn't resist quilting it this evening. I put on a movie because the distraction keeps me from getting too tense and tight with the quilting. All I can say is "that is what works for me!" There it is, quilted and laying across my sewing table. Of course I gave you a peek at the back in my last post, but I thought I needed to share more of it. The end pieces are a mottled gray that has a very slight blue tint. 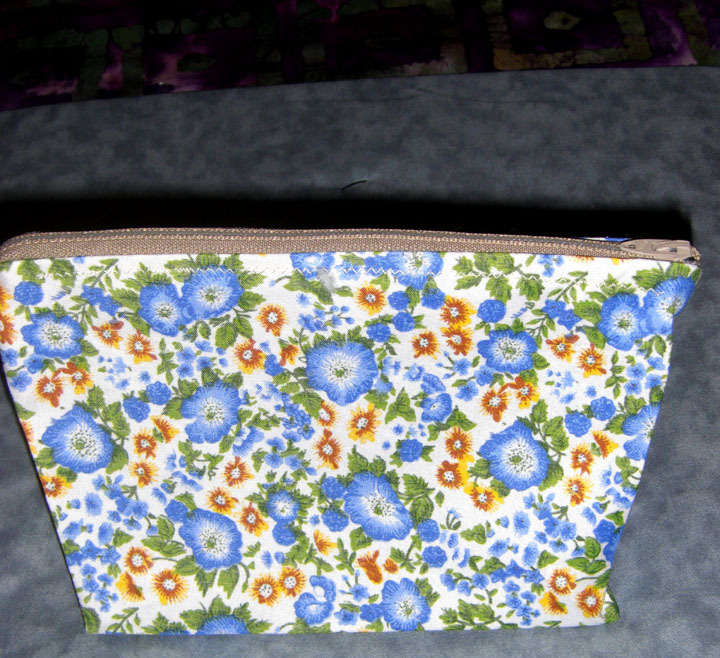 The purple batik is just a fun fabric that I liked as it echoes the color from the front. I put the yellow stripe off center to make it a little more interesting visually. All the pieces of the back are different sizes so that is it asymmetrical. I think this quilt is one that I would alternate which side is up. I have never made a back that I like this well. The quilting on this is a bit different. It is similar to my wavy grid pattern. However, for this I did some deeper curves and some that were more shallow again to give a variety for visual interest. I love the interesting shapes that it makes. 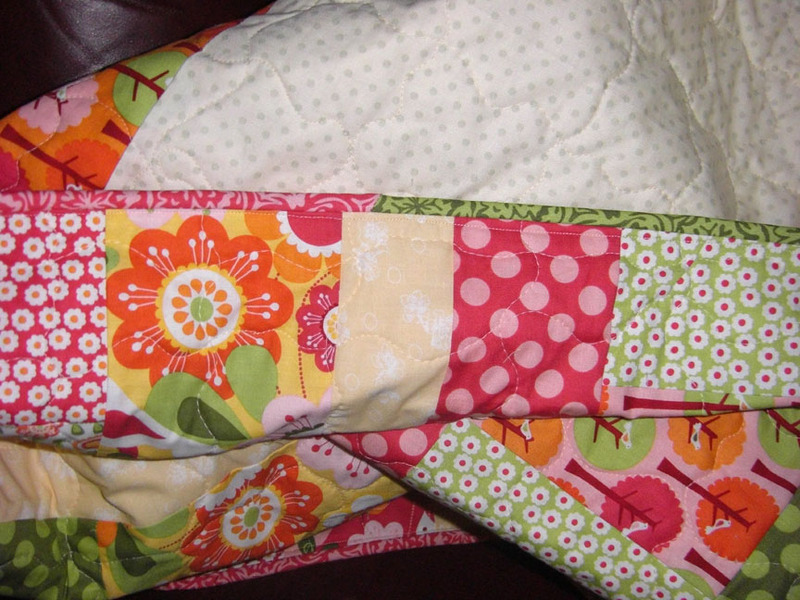 Now I have to decide what fabric I will use as a binding for this little beauty of a quilt. This weekend I did a few creative things. While I was cleaning up the studio area, I found an old "start" of a painting. My muse struck and I felt a need to work on this piece. 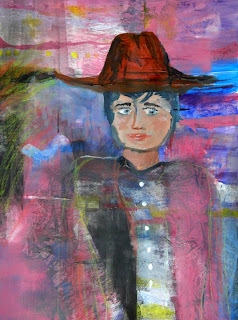 It was started as a non-objective work but I couldn't find the magic in it that way. In the early morning hours Saturday I awakened and just reflected. A crystal clear moment happened - I knew where it was going - or at least the next step. I went back to sleep. When I woke up and arose, the idea was still clear. Later in the morning I did a bit of painting. This morning (Sunday) I did a bit more. Here is what it looks like just at the moment. One of my FaceBook friends called it "Lonely Cowboy at Sunset" - I like that. I don't guide my paintings, I let them guide me whenever possible. We shall only see where it goes from here. 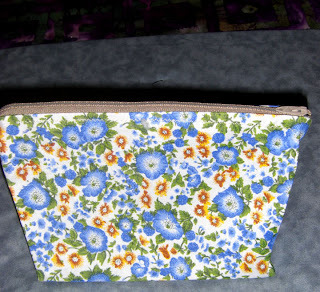 I also managed to make another little zipper pouch. What is that it is sitting on? Could that be a quilt? Yes it is, it is a quilt back to be exact. But you are only getting to see some of it here. The yellow strip is near the center and and the ends are very similar. This is going to be the back of the convergence quilt. And that is what I did creatively this weekend. What creative endeavor did you undertake? I have finished the Convergence Quilt top from my Stash This post. I decided that it needed to be bigger. 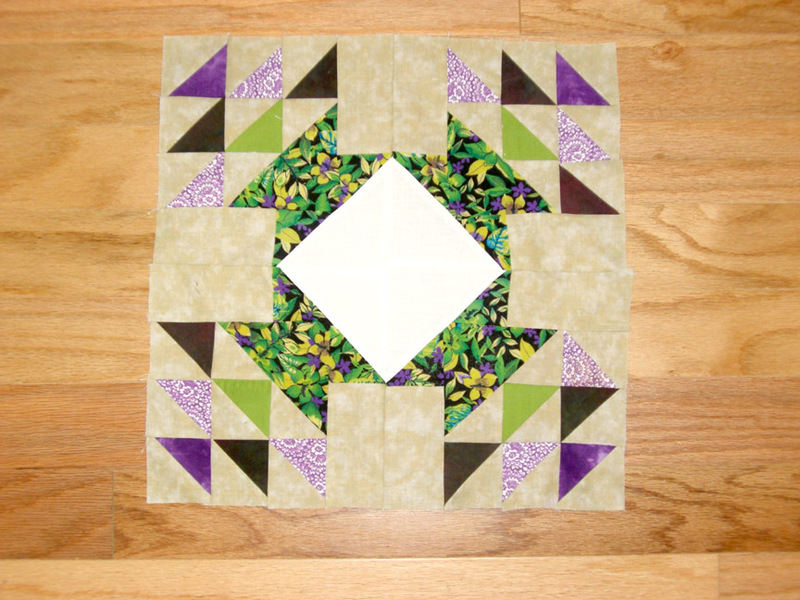 I added the pieced borders at each end to make it longer and then a yellow border all around to make it cohesive. The added yellow really made the center pop in my opinion. I am glad blogger is back up and running. I haven't mentioned the embroidery machine lately, but I have used it a few times. I totally messed up an inexpensive polo that I bought to put a work logo on. I am trying to figure out a way to salvage it. Ha ha. I pulled a few holes in it trying to remove the crooked embroidery. While I was using the machine, I realized that I was pretty limited in colors of embroidery thread. 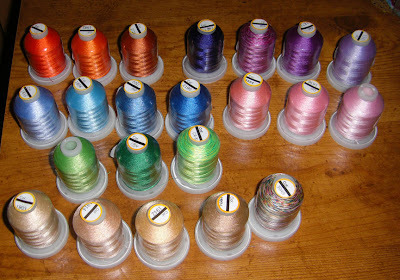 Here is what I had already and some of it is not embroidery thread. 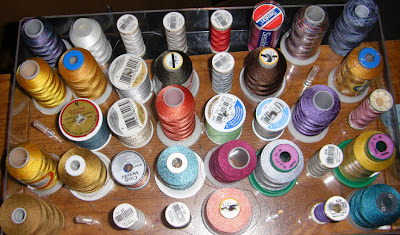 There are some spools of quilting thread in there and a couple of metallics that I don't even know why I have - but I plan to use them. Oh my, there are five six spools of gold toned embroidery threads in there. (yeah, I love gold thread.) In the back left corner there is a variegated that doesn't show well in the picture but does an excellent stitch-out. I needed some more thread. So, I ordered a little bit. They were out of stock on the darker browns I wanted. Oh! That means I get to shop again! Yaaay. But, where will I put all this thread? My thread boxes are f-u-l-l ---yes they are! I seriously need one of those wall thread racks. I guess it will go on my Christmas wish list. I also am working on the other quilt along block. But for now I am sleepy - so it is off to bed. I hope you have a great time being creative today! I have been noticeably missing lately. 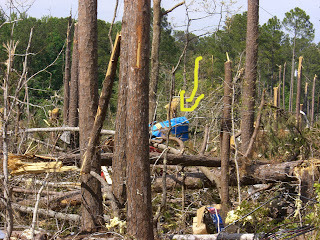 I am sure you have seen the news of the tornadoes in Alabama. 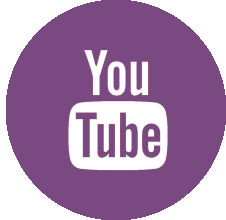 Here is a link to a story that will give you a better idea. 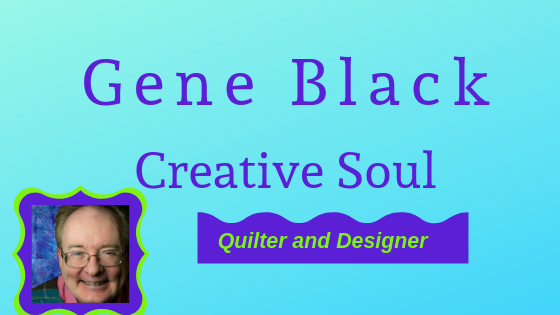 When we get things back a bit more normal I will try to be back with more quilty goodness. And if you don't ask a question, I may not reply to emails on this post. Thanks for understanding. First of all, I am sorry it has been a few days since I posted. We are still in Storm Recovery Mode and it does change your life for a while. Thursday the team I work on took a trip to one of our counties to access the damage. Our timing was good as we got to meet the State EMA director. The only picture I have of me with him is not the handshake picture I wanted. So I am not posting that one. Here is a picture I took of some of the damage. 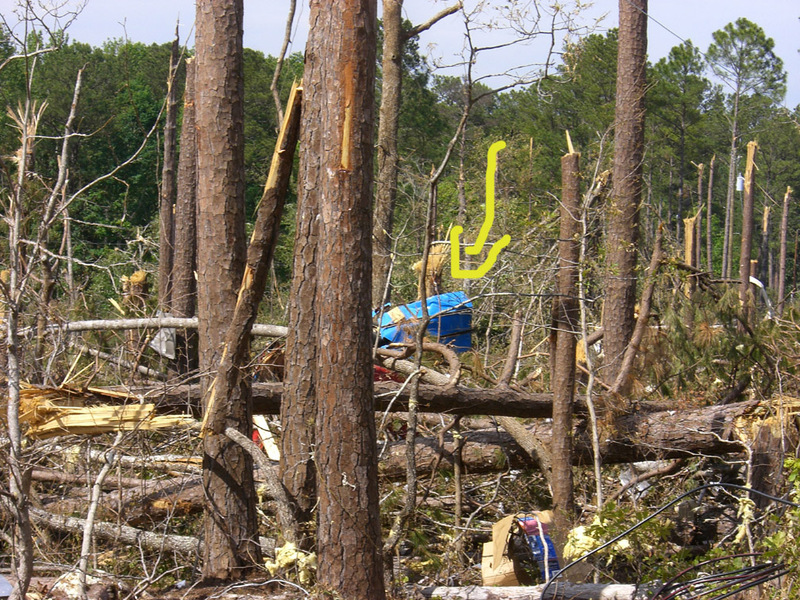 That yellow arrow is pointing to a blue thing - that is a car door. There was no blue car to be seen in the area. There were trees that were twisted wildly. There were piles of rubble where a house had been. Often the neighboring house was almost damage free. Some house had every shingle gone from the roof with just the tar paper under it left. Those were some of the lucky ones - they still had a roof. The AccuQuilt Go! 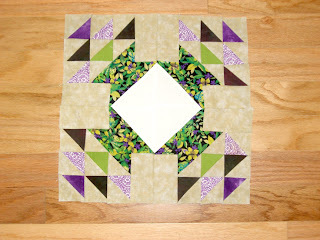 quilt along block was posted several days ago. We are to make two of these blocks. So far I have one made. It is NOT perfect, but I think it will work. 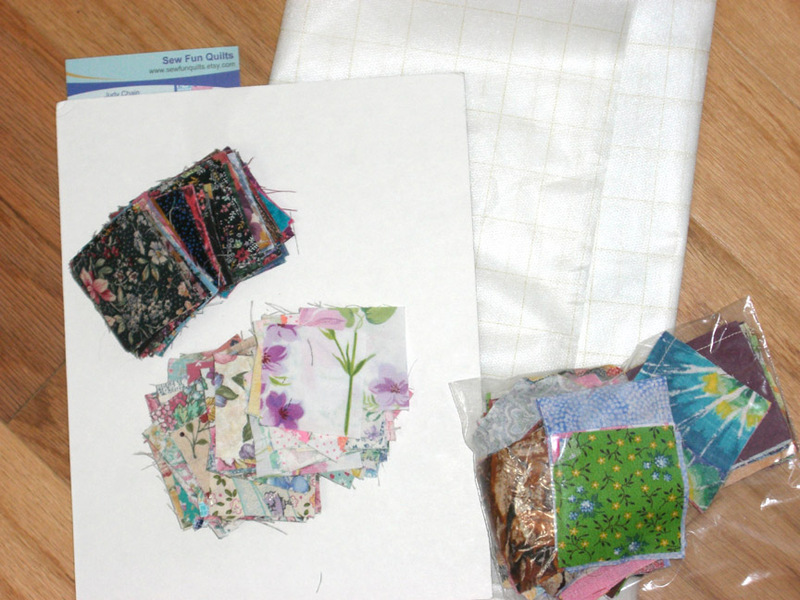 Also, a week or two ago I won a prize from Judy at Sew Fun Quilts. The prize was 200 pre-cut 2" squares to make a watercolor quilt. I just put the white cardboard under my prize pieces for good contrast. When I finally get the chance to play with this, it should be SEW Fun! Last night I got the back for the baby quilt pieced and the batting cut. Tonight I basted it, quilted it and trimmed it! Wow! I was in high gear. I used MistyFuse to baste it. 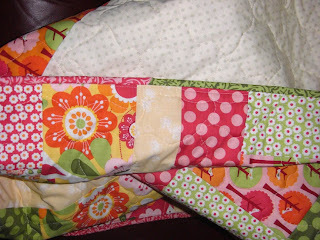 (just cut little pieces approximately an inch square and use them where you would use pins) Then I quilted it with a wavy grid which is really fast and easy. I do it free motion, but I forgot to lower the feed dogs. Guess what?! It worked just fine. So here is the back after it was quilted and trimmed. I was really aiming to have the pieced stripe above center, but it came out almost perfectly centered. I couldn't have done that if I tried! All I need to do now is bind this sweet little quilt. This part shows the embroidery on the pink square as well as my appliqued star. This picture shows the wavy grid quitling I did on this little piece. 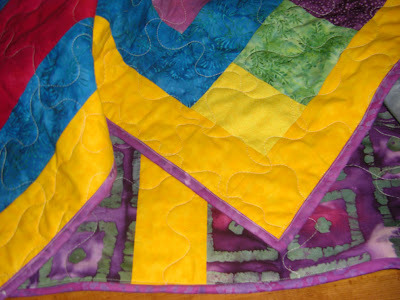 You just do free motion wavy lines in both directions and it forms a grid - this is easy quilting but it looks nice! In other news, I pieced the back for the baby quilt. I am not sure you will see that before it is quilted. I may just quilt the baby quilt with the wavy grid.